New Faction, and the return of Fear mechanics! It seems the fellers at Pine Box Entertainment have been keeping the biggest changes to DTR a tight lipped secret. Read the article to see what exciting changes they have in-store! Are there any native ways that existing cards interact with the Fear Level? For example, does each Abomination in play increase the Fear Level by one, whereas every Holy Ground in play reduces it by one? haha I think they had something there with those card stickers! Now, what day is it again???? I distinctly recall jordan_caldwell using Sweet n Low packets at a hotel Starbucks to represent a Tattoo. "How much firewater did Singing Feather knock back before a tramp stamp seemed like a good idea." Deadland plays like regular Doomtown with one added twist: The game tracks an ongoing "Fear Level" metric that ranges from 0 (minimum) to 3 (maximum) and represents the general air of supernatural malice that permeates the town. The Fear Level starts at 0, and players can take actions that permanently raise or lower it. 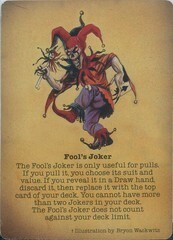 When a posse containing an Abomination, Harrowed, or Huckster dude as the shooter aces an opposing non-Abomination, non-Harrowed, or non-Huckster dude (as a casualty or via card effect), you may boot your Servitor Legend card or Fearmonger Outfit card to permanently raise the Fear Level by +1. If the aced dude was Blessed or a Shaman, raise the Fear Level by an additional +1. If the shootout occurred at a Holy Ground deed, raise the Fear Level by an additional +1. When a posse containing a non-Abomination, non-Harrowed, non-Huckster dude as the shooter aces an opposing Abomination, Harrowed, or Huckster dude (as a casualty or via card effect), you may boot your non-Servitor Legend card or non-Fearmonger Outfit card to permanently lower the Fear Level by -1. If your shooter was Blessed or a Shaman, lower the Fear Level by an additional -1. If the shootout occurred at a Holy Ground deed, lower the Fear Level by an additional -1. Hexes have their cost reduced by the Fear Level. Miracles and Spirits with a cost lower than the Fear Level boot their spellcaster if they fail the skill check. While the Fear Level is 3, the entire town is a "Deadland", and Servitor Legend cards and Fearmonger Outfit cards are worth 1 control point (each) while they are unbooted. Organizers may choose to run an ongoing League or Round Up by which, for example, the Fear Level starts higher than 0 (for all games), and/or tracks concurrently across multiple games as part of the same event (with the organizer announcing live changes! ), and/or rolls over across multi-day events (with the organizer posting ongoing changes), and/or gives special prizes for top-of "White Hat" and "Black Hat" players. I think this is a good way of using existing cards (outfits/legends) so that everyone can use a mechanic like this without stacks and stack of extra rules. Good work in making this elegant, could make for a cool event at a future gathering. Would there be interest in trying this format in Tombstone? We currently have an open slot for a side event during the Top 8 on Sunday. One is that I basically just stole a format PBE is already using (for Twilight Protocol Series) and carried it to it's logical next step by borrowing a concept-mechanic from Classic. Two, it was an explicit goal of mine in drafting these to not strongly incentivize building a deck specialized to the format - rather a "bring what you already got" type of incentive, which I estimate to be more appealing to more ("casual") players. So, definitely not opposed (I am by no means a "casual player" and love a deck-building challenge! ), just giving you some background to those decisions. Honestly, If I were to redesign Doomtown, one thing I would include now is a fear level, but not in the way it was implemented in Classic, but rather as a steadily increasing game-end counter of some sort. I feel like some games tend to take way too long, and Doomtown would benefit from a definite way to tell how many rounds the game should take at maximum. There could be a few cards to increase or decrease it, but it would always continue trudging forward to force things to a close. Fear level could also be used (maybe in combination with some effects) to reduce cost of certain expensive dudes/improve economy, like Wylie Jenks, Dave Montreal. Would be pretty thematic to have the big guys appear when stuff gets hairy. (Dunno about balance, i just personally never found a good way to really afford dudes like that or would choose them over someone that cost like 4-6gr+something else before the game was over). Q) How could multiple roads to victory interact with a central "fear clock" in terms of advancing fastlier / slowlier unto the games final turn? I think to answer this question, we'd need to first quantify the roads to victory individually and specifically before moving forward with ideation. For example, building off of @Antaiseito's idea above, the question to which that may be an answer to is something like "How do the high cost of 'closing dudes' affect the length of games?" Personally I think Fear has been supplanted by permanent control points. The Mausoleum, Concordia Cemetery, The Jail, Epidemic Lab, Stone, Hellstrome, Forced Quarantine and half the Outlaws all have built in ticking time-bombs that encourage conflicts. Cost reduction on big dudes would be nice though, and could be facilitated by a Legend of some sort. Main problem there is making an effect that doesn’t help low-mid cost dudes. Perhaps an affect like Lula’s Exploit where ghost rock can be built up and spent. “Boot, Pay X Ghost Rock: Play a dude reducing their cost by X to a minimum of 5”. You could also add “this dude has a permanent +1 upkeep” to prevent you from sitting on expensive dudes. I suspect that while yes, there are several "clocks" in the game for increasing control, that similarly, there also exists "anti-clocks" in the game for increasing influence. Testify to many people's experience that within a competitive time-sensitive context, at around the 45-55 minute mark, a game that has not already ended has a tendency to shift towards a different (and contrasting) system of incentives: playing to win and playing to win at time can, indeed, be different strategies as a game closes. Thus, I believe the "wish" here is that Fear Level, envisioned as some sort of mechanic, would ensure that the strategic incentives towards closing a game remain consistent through all phases (early, mid, late). The challenge naturally being that this is much easier to say than to do (like most things). Good discussion/debate even in a thread that is both old and an April Fool's joke. What is the world coming to? In tournament play I seldom have an issue with going to time: even in long tournaments where I've played 7-8 rounds and with decks that aren't Town Square Blitz (e.g. vanilla Law Dogs, Morgan Cavalry, Desolation Row Hexes and even Spirit Fortress) I've generally only had at most one game go to time, two across a whole 60 player event when playing Spirit Fortress. Games going to time generally isn't a huge issue in competitive play in what I've seen of the UK (including Euro/World events with international guests) and US events. However, there are multiple types of play, and I can see good theoretical reasons for a "clock"/push to end state style feature for both tournament play and casual play. On the other hand, Doomtown is already a fairly complicated game, and adding further rules mechanics to track/remember risks complicating things further. One or two more cards like Allie Hensman and the Epidemic Laboratory can help give everyone wider clock access without bloating the rules/adding more things to track. Admittedly, needs careful design/playtest to make sure these don't allow dull, uninteractive decks like Spirit Fortress. Allie and Epidemic Laboratory both have reasonable risk/reward. I really wanted to like the new L5R game from FFG (I was delighted when I got a ticket for the inaugural tournament!) but even as someone who normally likes "deep" games I found it took way too long and was far too fiddly.